For other uses, see Nicosia. 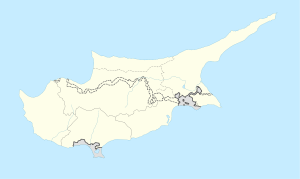 North Nicosia or Northern Nicosia (Turkish: [Kuzey] Lefkoşa [kuˈzej lefˈkoʃa]) is the capital and largest city of the de facto state of Northern Cyprus. It is the northern part of the divided city of Nicosia and is governed by the Nicosia Turkish Municipality. As of 2011[update], North Nicosia had a population of 61,378 and a metropolitan area with a population of 82,539. The Girne Avenue connects Sarayönü to the Kyrenia Gate and the İnönü Square in front of it. The avenue has been described as "the symbol of the walled city", and is filled with numerous shops and restaurants. A project is underway as of 2015[update] to redesign the area with a better infrastructure, visual quality and accessibility. The economy in the walled city has stagnated through the 2000s and 2010s, with the central Municipal Market losing its popularity, even though it has started to receive investment as of 2014[update] and programs have been put to place to reinvigorate the region with cultural activities being organized. In 2014, the Arasta shopping region close to the Ledra Street crossing was pedestrianized, which increased the popularity of the area. ^ "Cyprus". Lcweb2.loc.gov. 1967-11-20. Retrieved 2013-03-26. ^ "Nicosia Municipality". Nicosia.org.cy. Retrieved 2012-03-10. ^ Solsten, Eric. "Intercommunal Violence". US Library of Congress. Retrieved 2012-06-18. ^ "Ankara – Twin Towns". © Ankara-City.sk. Retrieved 2013-10-19. This page is based on the Wikipedia article North Nicosia; it is used under the Creative Commons Attribution-ShareAlike 3.0 Unported License (CC-BY-SA). You may redistribute it, verbatim or modified, providing that you comply with the terms of the CC-BY-SA.